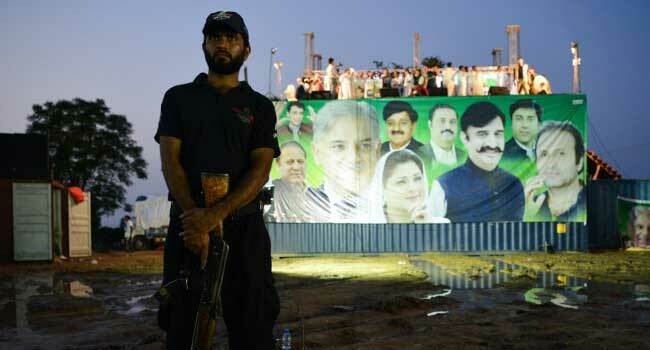 A Pakistani policeman stands guard beside a stage where Shabaz Sharif, the younger brother of ousted Pakistani Prime Minister Nawaz Sharif and the head of Pakistan Muslim League-Nawaz (PML-N), is to address his campaign rally in Pindi Gheb, in the district of Attock, in the Punjab province, on July 19, 2018, ahead of Pakistan’s election. A candidate for the party of Pakistan’s ousted former prime minister Nawaz Sharif has been jailed for life by an anti-narcotics court, just days before a general election. Hanif Abbasi, seen as a strong candidate for the Pakistan Muslim League Nawaz (PML-N) in Wednesday’s poll, was sentenced in a rare late-night session Saturday. Critics have long accused Pakistan’s powerful military, including its Inter-Services Intelligence (ISI) agency, of meddling in politics and judicial affairs, a charge it denies. Nawaz Sharif himself has accused the generals of targeting his party, including intimidating his candidates to switch allegiances — particularly in Punjab province. Earlier Saturday an Islamabad High Court judge, Shaukat Aziz Siddiqui, publicly accused the ISI of manipulating judicial decisions. “ISI is fully involved in manipulating judicial process. ISI people get their choice of benches formed in the courts, cases are marked,” he told lawyers in the garrison city of Rawalpindi. The political involvement of the military and ISI is rarely discussed openly due to fear of repercussions. Rights defenders have long accused the ISI of kidnapping and torturing rights activists, journalists and dissenting voices. Journalists in Pakistan say they have come under unprecedented pressure from the authorities before the election. Nearly 106 million Pakistanis, including more than 19 million new voters, will be eligible to cast their ballots on Wednesday. The Pakistan Muslim League-Nawaz, which took power in 2013, hopes for a new mandate under leader Shahbaz Sharif, a brother of the ousted Nawaz. Its biggest challenger is the Pakistan Tehreek-e-Insaf, led by former national cricket captain Imran Khan. The Pakistan Peoples Party of Bilawal Bhutto Zardari — son of murdered premier Benazir Bhutto — could become kingmaker by forming a coalition with one of its rivals.